DO YOU KNOW WHERE FIRST IMPRESSIONS HAPPEN? CLUE: IT’S NOT AT YOUR RESTAURANT. Competition in the restaurant business is notoriously fierce. Today’s customers expect unique, positive and memorable dining experiences. 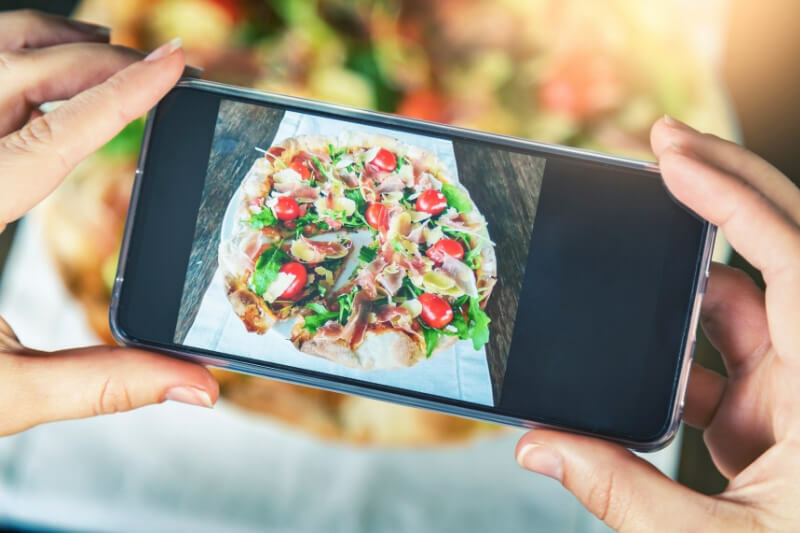 For restaurateurs and food service executives, these expectations call for innovative restaurant marketing strategies that attract customers and spark food sales. Nowadays, these strategies need to reach and impress customers before they set foot in a restaurant. First impressions happen on websites, social media and mobile apps. Engaging existing and potential customers through effective restaurant digital marketing tactics is as important as the menu, food, ambiance and customer service. Restaurant marketing has been significantly transformed by digital technology. Following are eight digital marketing ideas and strategies that can help you attract customers and increase your food and beverage sales. Today’s potential customers are more likely to find you online than on the road. Having a website allows your restaurant to be found by people all over the world. Remember that online visitors care less about your backstory than about your menu, hours, address and phone number, so include those. Make sure your website gives the right first impression. For customers to find your website, it needs to show up high in online search results. Search engine optimization (SEO), geo-targeted ads (local results), Google My Business and AdWords, Bing Ads, blogs and mobile ads are among the SEO tools you should use. Mobile apps, which are becoming more accessible and affordable for small businesses, enable customers to order directly from their phones and allow you to offer price promotions and increase customer loyalty with points or reward programs, among other functions. Email marketing is an effective way to acquire and retain customers. Emails can announce menu items, exciting promotions, holiday specials and other events. You can personalize them to congratulate customers on their birthday and send them coupons or redemption codes for a free or discounted meal. You can build an email list by asking customers to fill forms in person or online, and digital tools can send the emails for you. Word-of-mouth will always be the most powerful form of marketing. Partner with vendors and like-minded businesses that serve the same audience to promote each other in social media. Invite bloggers and critics to dine with you and post online reviews. Turn your loyal customers into brand ambassadors by offering them rewards in exchange for social media posts. Social media is an inevitable part of running a modern business. It can put your restaurant in front of thousands of potential customers. Your current and future customers are on social media right now having conversations about where and what they eat. Don’t wait for customers to come to you—go where they are. Post text, photos and video regularly on the top websites. Encourage your patrons to follow you on social media. Capitalize on trending topics. Use popular hashtags. Consider social paying: allowing diners to pay for their food by sharing posts about your menu items on their social media pages. Promote user-generated content. Host social media contests featuring photos, videos, hashtags and prizes. When in doubt, hire a social media expert. Price promotions and contests are a great way to spread the word about your restaurant, attract first-timers and encourage repeat business. Below are some of examples. Offer your social media followers exclusive deals or coupons they can share online. Create unique online price promotions for holidays and special dates. Develop online customer loyalty and rewards programs. Hold fun contests that combine in-restaurant and online activities. Nothing destroys a restaurant business like a bad review. Your digital marketing efforts could go down the drain if you don’t have a good online reputation management strategy in place. Monitor online reviews of your restaurant. Respond to customer queries, negative and positive reviews in a timely, respectful and friendly manner. A thoughtful reply can turn a critic into a fan. The online success of your restaurant depends on your offline performance, so first get your offline activities—food, service, etc.—right. You’ll probably discover that there’s only so much you can do on your own. Hire digital marketing and social media experts to ensure the successful development, deployment and management of your restaurant digital marketing efforts and campaigns.